The Barak is the main river of the district and apart from that there are numerous small rivers which flow from Dima Hasao district, Manipur or Mizoram. The district is mostly made up of plains, but there are a number of hills spread across the district. 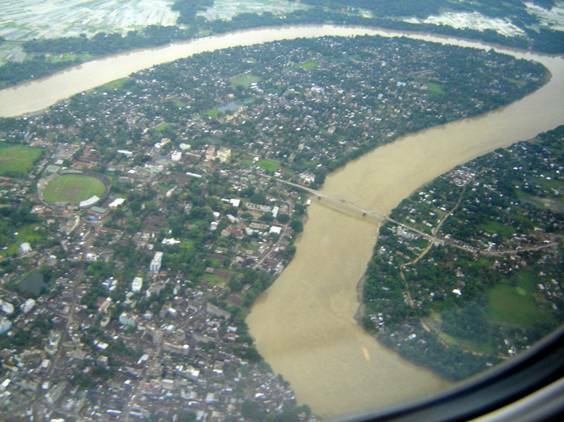 Cachar receives an average annual rainfall of more than 3,000mm. The climate is Tropical wet with hot and wet summers and cool winters. The climatic condition of this district is significant for humidity and it is extremely beyond the limit. And because of this reason, during summer, it is intolerable. During the winter season, it is as cold as other parts of north India and the rainy season of this district starts from May and ends after October. Bengali is the status of Official Language in this district with majority of the people primarily speaking Bengali and Sylhette, a Bengali-dialect. Apart from Bengali, other minority languages spoken in the district include Meitei Manipuri, Bishnupuriya Manipuri, Dimasa and Rongmei-Naga. There are also few Mizo, Kuki and Khasi people who form microscopic minority. Among the 15 agro-climatic regions of the country, categorized/identified on the basis of homogeneity in agro- characteristics, Cachar falls in the Barak Valley zone. The agro climatic conditions of the district are conducive for various agricultural activities like development of the plantation crops viz., tea, rubber, cashew, coffee, areca nut, coconut and also aromatic plant like Patchouli. The types of land available in the district are classified as: medium land-69048 Ha, high land-11642 hectares, low land-19512 hectares, very low land-10792 hectares and beel area -4735 hectares. Crops cannot be grown in more than 20 percent of geographical areas of the district during April to September due to water stagnation. On the other hand due to lack of rain from November to April, most of the cultivable land remains fallow during the period. The district falls under Barak river basin. The soil of the district is clayey loam, alluvial and red alluvial. The soil is highly porous and therefore, lacks moisture retention capacity and is susceptible to erosion. The water level in the district is very low. The district has a total forest cover of 2225 sq.km area which is 58.77 percent of its total geographical area as per the estimates of Forest Survey of India. The dense forest cover in the district is 45 percent while 55 percent of the forest cover is under open forest.The District is a heterogeneous plain composed of both low lands and high hills and level plains. Actually the whole of the District lies at the foot hills of the nearby sates of Manipur and Mizoram and that of the Dima Hasao district ofAssam. The Bhuban ranges on the eastern side of the district covers a considerable area. The river Barak, along with the tributaries, Jiri, Chiri, Madhura, Jatinga, Sonai, Katakhal and others are flowing through the centre of the plain valley of the district. Explorations by ONGC in different parts of Cachar have indicated that there are huge mineral oil and gas deposits in various parts of the district, mainly in the Adamtilla area. Silchar, the district headquarter town, situated on the South bank of the Barak river is an important commercial centre of the state .A gateway to Mizoram, Manipur and Tripura, the town naturally plays a vital role so far supply of essential commodities etc to those states is concerned. A medical college, station of All India Radio, TV Station and several other organizations has helped the town grow in importance. The district of Cachar is the home of a large number of Tea Gardens of the State. Lakhipur is the richest pine - apple growing area in the country, again on the bank of Barak.